The Best SQL blogs from thousands of top SQL blogs in our index using search and social metrics. Data will be refreshed once a week. Also check out SQL Podcasts and SQL Youtube Channels list for Top videos on SQL. SQL newsletter is a comprehensive summary of the day's most important blog posts and news articles from the best SQL websites on the web, and delivered to your email inbox each morning. To subscribe, simply provide us with your email address. Denver, CO About Blog SQLServerCentral is the #1 education & community site for SQL Server, featuring Articles, News, Forums, Q&A, Scripts, Tutorials & Book Reviews. Facebook fans 3,339. Twitter followers 9,569. India About Blog Pinal Dave is a technology enthusiast and an independent consultant. He has authored 11 SQL Server database books, 20 Pluralsight courses and have written over 3600 articles on the database technology on his blog at a http://blog.sqlauthority.com. Along with 14 years of hands on experience he holds a Masters of Science degree and a number of database certifications. Facebook fans 77,887. Twitter followers 1,258. Fort Collins, CO About Blog Your database authority, providing practical Microsoft SQL Server database advice for database administrators, developers, and business intelligence analysts. Facebook fans 17,587. Twitter followers 14,220. About Blog The goal of /r/SQL is to provide a place for interesting and informative SQL content and discussions. Facebook fans 1,086,909. Twitter followers 470,591. About Blog SQL Shack is a new SQL server blog with articles about database auditing, server performance, data recovery and more﻿. Share SQL knowledge, help you learn about SQL and communicate with people from SQL world. Facebook fans 898. Twitter followers 4,210. About Blog This blog is about SQL Server, T-SQL, CLR, Service Broker, Integration Services, Reporting, Analysis Services, Business Intelligence, XML, SQL Scripts, best practices, database development, database administration, and programming. Chicago About Blog The Brent Ozar Unlimited® blog covers SQL server news and free SQL Server training tips about clustering, AlwaysOn, performance tuning, T-SQL, and more. Facebook fans 1,389. Twitter followers 23,911. Seattle, WA, US About Blog The world-renowned SQLskills team is dedicated to providing the highest quality and most in-depth SQL Server training and consulting in the market. Facebook fans 2,146. Twitter followers 4,757. Newton, MA About Blog Interesting tidbits about Microsoft SQL Server (and lots of other stuff about IT) that will help you build a rock solid database server and keep it running for many years to come. Facebook fans 166. Twitter followers 4,339. Cambridge, UK About Blog Redgate makes ingeniously simple tools used by over 600,000 SQL Server, .NET, and Oracle professionals worldwide. Facebook fans 2,583. Twitter followers 17,870. Cary, NC About Blog ThatJeffSmith blog is about tips and tricks for Oracle SQL Developer, SQLcl, SQL Developer Data Modeler, and Oracle REST Data Services. My primary goal is to help you save time when working with Oracle Database. If I can ALSO make what you’re currently doing a little more fun, then that’s a big bonus for me. Facebook fans 292. Twitter followers 6,908. Hyderabad, India About Blog I'm Anvesh Patel, a Database Engineer certified by Oracle and IBM. I'm working as a Database Architect, Database Optimizer, Database Administrator, Database Developer. Providing the best articles and solutions for different problems in the best manner through my blogs is my passion. I have more than six years of experience with various RDBMS products like MSSQL Server, PostgreSQL, MySQL, Greenplum and currently learning and doing research on BIGData and NoSQL technology. Facebook fans 19,279. Twitter followers 82. About Blog Comprehensive up-to-date coverage for sql, aggregated from news sources all over the world by Google News. Facebook fans 358. Twitter followers 212,888. About Blog TechBrothersIT is the blog spot and a video (Youtube) Channel to learn and share Information, scenarios, real time examples about SQL Server, Transact-SQL (TSQL), SQL Server Database Administration (SQL DBA), Business Intelligence (BI), SQL Server Integration Services (SSIS), SQL Server Reporting Services (SSRS), Data Warehouse (DWH) Concepts, Microsoft Dynamics AX. Facebook fans 1,133. Twitter followers 45. Charlotte, NC About Blog SentryOne empowers Microsoft data professionals to monitor, diagnose, and optimize performance across physical, virtual, and cloud resources. Facebook fans 1,552. Twitter followers 4,212. India About Blog This blog shares technical articles on SQL Server, TSQL, SQL, Database Development, Database Design, Data Warehousing, ETL, Unix, Linux and C (CPP). Facebook fans 1,042. Twitter followers 43. Facebook fans 227. Twitter followers 956. About Blog SQLServerGeeks.com is a community portal on Microsoft SQL Server. This community portal contains a collection of SQL Server Blog, Events, Webcasts, Videos, SQL Server learning & education content. Facebook fans 14,130. Twitter followers 1,643. New York, NY About Blog Allow systems administrators to maintain SQL Server databases from any place on the Earth. Facebook fans 2,144. Twitter followers 55. About Blog This blog is to share some of the interesting bits and pieces I’ve either learned over the years or that I’m just now learning. About Blog Thomas LaRock is a Head Geek at SolarWinds and a Microsoft® Certified Master, SQL Server® MVP, VMware® vExpert, and a Microsoft Certified Trainer. He has over 15 years’ experience in the IT industry in roles including programmer, developer, analyst, and database administrator. Facebook fans 1,883. Twitter followers 14,077. About Blog Learn about SQL Server DBA, SQL Server database performance,SQL Server optimisation,database tuning,t-sql,ssis,powershell. New Delhi, India About Blog Blog by Pawan Kumar Khowal. T-SQL, SQL Server, MDX, DAX Specialist, Reporting Services (SSRS), Integration Services, Analysis Services (SSAS), Tabular Model. Facebook fans 826. Twitter followers 66. Portland, OR About Blog Kendra Little writes about code, query optimization, and database management using Microsoft SQL Server. She specializes in indexes, TSQL, and doodling. Facebook fans n/a. Twitter followers 8,829. About Blog RebellionRider aims to provide all kinds of easy to understand tutorial videos on SQL, SQL Developer, PL/SQL and Oracle Database. About Blog Get the latest information, insights, announcements, and news from Microsoft experts and developers in the MSDN blogs. Facebook fans n/a. Twitter followers 716. About Blog DotNetVibes is a blog with articles related to .Net and SQL Server & would contain tips, tricks, new features and information around the latest technologies The articles will be suited for all levels of developers – beginners to advanced. Facebook fans 77. Twitter followers 217. About Blog A blog about Microsoft SQL Server,Integration/Reporting/Analysis services,T-SQL,SQL Server XML/JSON/R,Microsoft Azure,Machine learning,Excel/Power BI. Facebook fans 106. Twitter followers 27. Dallas, TX About Blog Ryan Adams Blog consists of SQL, Active Directory, Scripting. Facebook fans n/a. Twitter followers 1,567. About Blog Microsoft SQL Server blog posts. India About Blog Learn database in a simple and easy way. Facebook fans 172. Twitter followers 198. South East, England About Blog The Undercover DBAs are a couple of database nerds who love nothing more than to spend their time, reading about, researching and sharing all things SQL. Facebook fans 4. Twitter followers 6. About Blog Paul Turley sharing his experiences with thee Microsoft data platform, SQL Server BI, Data Modeling, SSAS Design, Power Pivot, Power BI, SSRS Advanced Design, Power BI, Dashboards & Visualization. About Blog My launch pad area to discuss all things around MS Data Technologies. Dallas, TX About Blog SQLRx provides expertise and assistance to companies needing SQL Server Database Administration services and/or Performance Tuning Analysis assistance. Facebook fans 42. Twitter followers 16. Bangalore About Blog This blog is explaining the bits and bytes of SQL Server and Azure. Facebook fans 1,079. Twitter followers 905. New Hampshire About Blog Straight Path Solutions is a team of SQL Server consultants with many years of experience and a drive to help clients succeed. They help you make your data and performance problems go away while teaching you tips and tricks to solve them on your. Facebook fans 122. Twitter followers 2,505. London, England About Blog My learnings and thoughts on SQL Server and PowerShell. Facebook fans n/a. Twitter followers 623. Chicago About Blog This blog is all about Oracle PL/SQL. PL/SQL Evangelist at Oracle Corporation Lives in Chicago, IL, United States. Facebook fans n/a. Twitter followers 6,106. London About Blog The focus of this blog try to help bring some of the more modern practices from development to the world of Sql Server development. Things like SSDT, source control and continuous integration. Washington, DC About Blog This blog is all about SQL server. Mohammad Darab is SQL Server consultant. Manhattan, NY About Blog SQLSoldier blog shares news related to SQL server. Facebook fans n/a. Twitter followers 6,157. Dallas, TX About Blog SQL Tech Blog is a personal blog for Microsoft SQL Server database tips, tricks, training, events, news, and much more. Chennai About Blog Madhivanan is a SQL Server MVP, blogger and SME. Facebook fans 995. Twitter followers 274. About Blog My SQL Server Ramblings. Facebook fans 308. Twitter followers n/a. Surat, India About Blog SQL Server Citation is evolved as a content rich blog over years, initially my idea was to post articles here just for the sake of my knowledge and reference. Eventually, I started posting more frequently and amazed to see that other people are also reading my blog articles. I tried to post tips and tricks, and some time how to kind of article that interests me and I think SQL Server community will get benefited. Facebook fans 1,592. Twitter followers 782. Seattle, WA About Blog This blog is on Data Platform, SQL Server, Azure and anything data. Facebook fans 283. Twitter followers 1,929. About Blog Prashanth Jayaram is a DB Technology Enthusiast [SQL To NoSQL] & PowerShell Scripting, Author, Blogger, Operations-Mgr at CTS, Automation Expert, Technet WIKI Ninja, MVB and Powershell Geek. United States About Blog SQL Server Articles, Tips, Tutorials, FAQs, News, White Papers etc with real world example to solve daily problems faced by DBAs, Developers, Business Intelligence Professional all for free. Facebook fans 1,061. Twitter followers 1,003. Dallas, TX About Blog SQL Server Performance Tuning, Consulting, Training and Remote DBA Services. Facebook fans 30. Twitter followers 1,175. 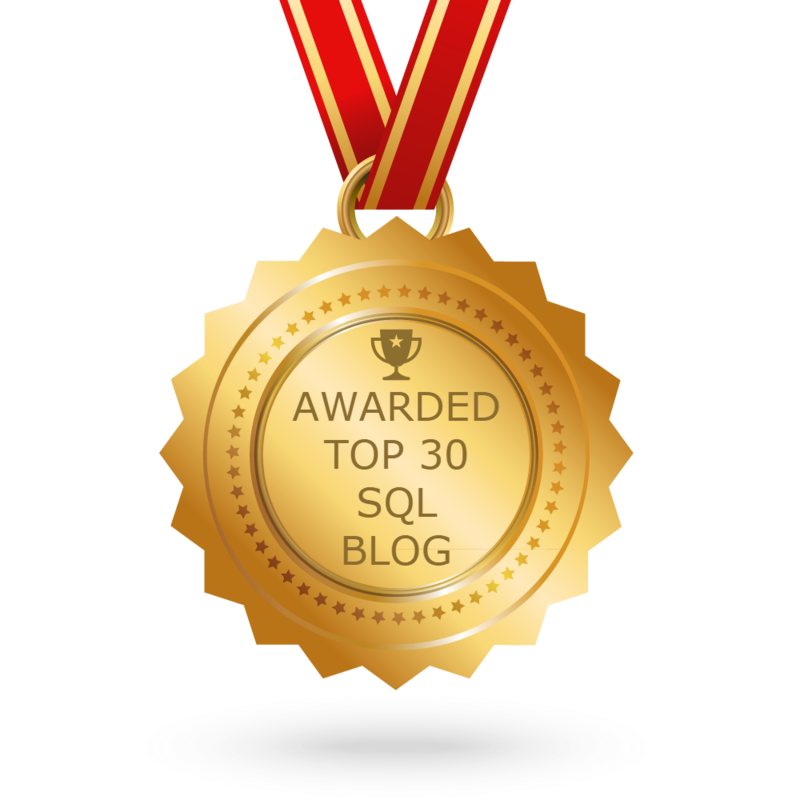 CONGRATULATIONS to every blogger that has made this Top SQL Blogs list! This is the most comprehensive list of best SQL blogs on the internet and I’m honoured to have you as part of this! I personally give you a high-five and want to thank you for your contribution to this world.